If you are an allergy sufferer, you are probably aware that the indoor air quality in your home and place of work will play a major role in whether or not your allergies are irritated. Others with diseases like COPD or other breathing problems can also suffer if the air is not filtered or purified in some way. 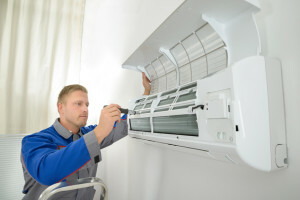 Air quality can be one thing your West Chicago Air Conditioning Tune Up expert at Air Choice Heating and Cooling tests for when they provide your yearly air conditioning tune up. Our West Chicago Air Conditioning Tune Up contractor can test the particulate matter in your air and recommend the best solutions to give you clean air in your home. The ductwork in the air conditioning system is one area of the home that can collect a lot of dust, dirt, grime, and other irritants. Carpeting and upholstery, curtains and other fabrics, and furniture, knickknacks, lamp shades, and more collect dust. Regular vacuuming is necessary and will do much to help remove these irritants. However, many vacuums only end up blowing the dust and dirt back into the home. Allergies can be irritated by the dust and dander in your home. The dust contains tiny microscopic dust mites that live in the house dust. The house dust consists of dander and skin particles that are shed by occupants of the home. The mites live off the dander, consuming it to survive. Children with allergies are often susceptible to irritants such as dust and pollen and are prone to get reoccurring sinus or ear infections. The elderly and ill are also susceptible to getting sick from too much dirty air. The ductwork, the air handler, and all systems that route air around your home should be cleaned on a regular basis, at least once every year or two, so your home is cleared of all the irritants and air pollutants. However, if you don’t keep a system in place to filter these materials from your air, you’ll only end up with the same problem within a few months. That’s what makes an air conditioner tune up important. Not only will you’re A/C be thoroughly maintenance, but we can discuss getting you an air filtration system in place that will improve your air quality by as much as 99.98% with the filtering out of the unwanted allergens floating around in your air. You have many options available for air filtering for your air quality control system. Whether you choose a portable unit or a whole home air purification system, you’ll be improving your air quality. Air filtration units remove contaminants from the air that can cause illnesses in humans. But cleaning the air will alleviate allergy symptoms and can help your family stay healthier. Have you ever shaken out a rug or moved a curtain and immediately see a bunch of tiny fibers in the air that float around? Sometimes they’re difficult to see until the sunlight hits them a certain way. This is dust in your air and you are breathing it in and out all the time. Our noses are equipped with tiny hair filaments that catch most of this debris. And it does pretty much irritate just about anyone with a nose, but for some people it can mean a poor quality of life if these irritants cause further health issues. Many people suffer from allergies, but there are also a huge number of elderly, young children, and people with illness that will suffer greatly in poor quality air. If you are looking for an West Chicago Air Conditioning Tune Up Professional, call 630-501-8027 or fill out our online request form.